By Yeshua Moser-Puangsuwan, Senior Editor, Landmine and Cluster Munition Monitor Report. One of the most well-known and extensive mine fields in the world separates North and South Korea, where both countries are known to manufacture landmines and cluster munitions, and are believed to possess significant stockpiles. Campaigning on the Mine Ban Treaty and the Convention on Cluster Munitions in North Korea has not occurred. However, South Korea possesses energetic campaigns for both conventions. The Korean Campaign to Ban Landmines or Peace Sharing Association (KCBL/PSA) is one of the earliest national campaigns of the ICBL, launched in 1995 after the Third International NGO Meeting on a Landmine Ban. It has worked tirelessly to reveal the number of victims of antipersonnel landmines within the country and to seek compensation for them. 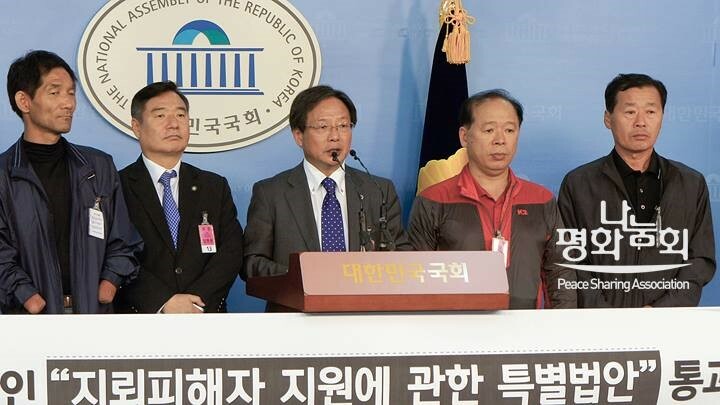 In September, the National Assembly of Korea (South Korea) passed legislation KCBL/PSA has been lobbying for during the past decade and a half. A victory for them and a tribute to the perseverance of KCBL/PSA founder, Professor Cho Jai Kook. The most recent version of the legislation proposed by KCBL was introduced in January 2013 by 31 Assembly Members. On 30 September 2014 the Special Act on Assistance to Landmine Victims was passed by the National Assembly and became effective 30 March 2015. KCBL/PSA is focusing its efforts now on the formation of the Compensation Committee which will determine eligibility for compensation. It will have 7-10 members, the majority of whom will be from the civil sector. KCBL/PSA expects to be represented on the committee by more than one member. KCBL/PSA foresee some difficulties in implementation of the Act due to the fact that there are no governmental records of mine incidents within the country. Applicants will have to provide what evidence they can to substantiate that their injury was indeed caused by a landmine and not some other cause. For victims from the 1960s and ’70s that will be difficult. Previously KCBL/PSA completed the country’s only landmine victim survey. It occurred in Gangwon-do province, documenting 64 landmine victims. This has not yet occurred in the other key province which sits on the demilitarized zone (DMZ), Gyenggyi-do. The government has now introduced legislation for the national assembly that would allow for non-military mine clearance to take place in the country, and has scheduled 80% of the existing mined areas as no longer necessary for national security. This legislation is yet to be passed, however it would open the possibility for clearance of those areas. KCBL/PSA has the intention of hosting an event in April 2015 to welcome and publicize the new law on victim compensation. KCBL has its office at Yonsei University. World Without War is the creative and energetic Cluster Munition Coalition (CMC) campaign member in South Korea. The youthful group carries out a variety of counter militarism campaigns within the country. The CMC activists were formerly members of the group Weapons Zero, which merged with World Without War in February 2015. In 2014, Korean CMC activists focused on divestment campaigning. The key focus of their divestment drive was the Korean National Pension Service. In June the group set up a picket in front of the Pension Service Building in Seoul. Campaigners sought clarification from the Minister of Health and Welfare regarding the government’s position on applying Social Responsible Investment criteria into its pension fund management regarding exclusion of cluster munitions producers from its investment universe. The response campaigners received was ambiguous, and it remains unclear whether this will include any curbs on investments in weapons manufacture. In August, Korean CMC campaigners organized a “take the subway” action. 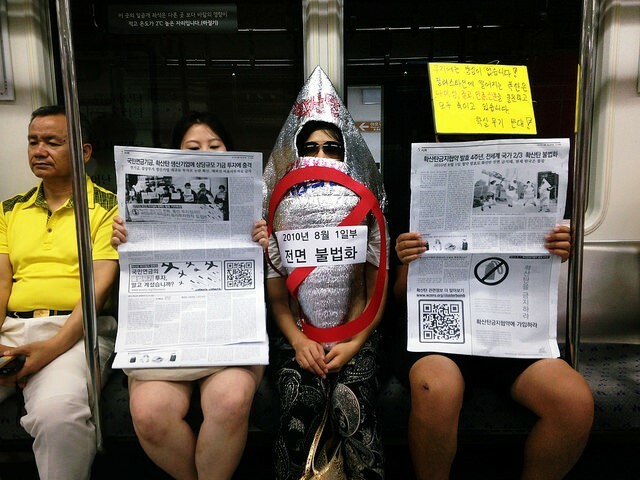 During the day, campaigners rode the subway in cluster munition costumes accompanied by citizens reading newspapers. However the newspapers were actually cluster munition campaign articles constructed to look like an ordinary newspaper (see photograph). A QRcode on the paper took observers to the campaign website. In November 2014, Korean CMC campaigners made the Korean section of the 2014 Worldwide Investments in Cluster Munitions Report available in Korean language. In December 2014 Korean CMC campaigners conducted another picket of the NPS Fund Committee in Seoul. For more information on South Korea, see the Landmine Monitor and Cluster Munition Monitor reports. ← Ukraine, are “live” landmines being used for training?